To recap my unsaved-thus-loved post, here’s a picture of myself last January 1, 2012 upon arrival at my house, just before cleaning up to sleep. Just a reminder of my new year. What we did on New Year’s eve is just a bit typical of a typical weekend, with only the change of “year” as an exception. 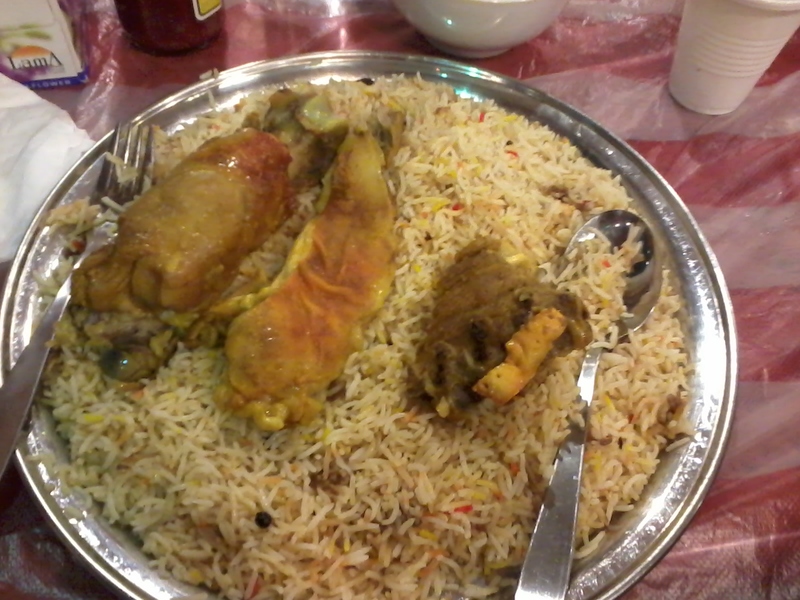 Me and my couple-friends went to church and had dinner at the restaurant across our building (Zainah). Here’s a very BIG meal that I wasn’t able to finish. This is a meat mandi (lamb). Thanks to Duanerdude for paying for this meal. YAY. Duane order a chicken Mandi (not shown in the picture) and a Camel Kebab (shown below). It tasted a bit similar to lamb but it’s all good. Knowing that it’s healthier, I loved it! Since all I wanted was to atleast see some fireworks, me and my couple-friends went to Meydan and watched the fireworks display at the tallest building in the world–Burj Khalifa. Here’s the tallest building just before it turned 2012! My fireworks photo (I forgot to bring a camera, and I wasn’t really familiar with the one I borrowed). 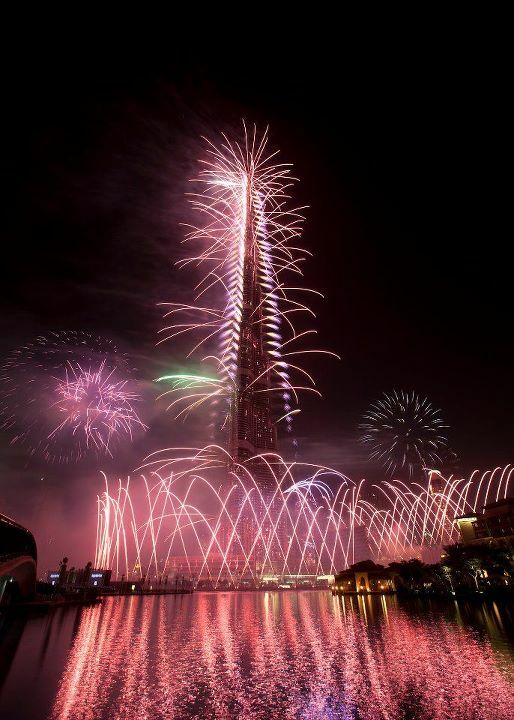 And here’s the TRUE good photo captured courtesy of https://www.facebook.com/DowntownDubai of the fireworks worth more than 1M aed (which is like 300k USD). This New Year wasn’t as eventful as my past New Year’s eve celebration… It was just normal. You could say it was like another weekend. But what’s the difference of this weekend compared to other weekends apart from slashing 2011 and making it 2012? I guess for most of us, it’s like a signal to start anew, or a push to better things. Though we are allowed to change, start anew, or move forward in anytime of the year–whenever we want to, the New Year somehow serves as a cue to those who needs that “sign” of moving forward. Another year has come and it’s very inspiring and rewarding to know that we are all still here, given another chance for a New Year, a new life, or change. Yes, we don’t have to wait til a new year comes–but what about for those who needs an extra push? Now, here’s a video of the fireworks display in Burj Khalifa, courtesy of my good friend Didi. May all of us have a Prosperous and Happy New Year! It’s 2012 AD!!! Today is the 2nd to the last day of the 5-day long weekend in celebration for the Eid Al Adha here in Dubai. Since my passport is still with the Consulate of the Netherlands (for my upcoming Euro 2011 travelshiz), I’ve no choice but to just be here–literally here in my current base, Dubai. My roommate left me for a short holiday to Vietnam. Oh trust me when I say I’m soooo excited for her trip. I’m not envious (believe me when I say this time that I’m not that envious) of her going… To be honest, I was actually a bit sad for myself because I’d be spending this longgggg holiday alone here in this empty studio of ours. No friend to chat with about random ridiculous stuff. No “boy” talks. No narcissistic convos. No “tipid” (thrifty) food galore. No nothing. Just me, myself, and my laptop (and yes, dirty laundry). Good thing, there’s what we all call as “friendly neighbors” to the rescue… My friend-friends. 🙂 [Barsha people +more!!]. So, what did we do for the past few days? Duh!!! What we’ve always done in each weekend–only this time, LONGER! What I like (and have somehow discovered) here in Dubai is the extensive fooooooddddd choices. Saturday (day 3): Tim Horton’s at Sheikh Zayed, then dinner at Thyme Buffet at JBR. After which, after dinner drinks at a friend’s (didi’s) house. Sunday (day 4): dinner at Bricklane, Al Barsha, then Yougurt at Red Mango, MOE (the chocolate flavor is LOVEEEE), thennnnn another after dinner drinks at a friend’s (marian’s) house. SO there… my “being stuck” at the base isn’t too bad after all. I got to appreciate Dubai as a 2nd place of residency for me (sorry kids, but the term home is a bit strong, soooo it might take a while for me to call it that :P)… Thanks to the easy food access and the amazing people I get to share it with. Allowing myself to feel today. Is it really okay to get lost?